The primary mission is to operate U.S. garrisons and support joint communities in order to execute national defense strategy, support theater lines of communication throughout the entire footprint. SHAPE is led by the Supreme Allied Commander in Europe (SACEUR), a four-star general Officer. 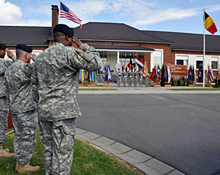 USAG Benelux provides Army base operations services for joint military and inter-agency communities to support US interests in NATO.